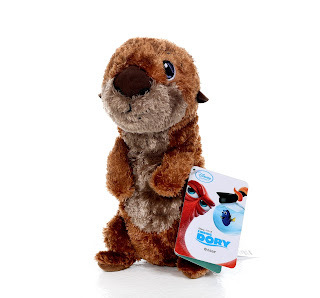 After watching Finding Dory, I think a lot of us wanted to take home our own baby sea otters to have "cuddle parties" with. My wife and I can't be the only ones right? Well thanks to the Disney Store, you can! 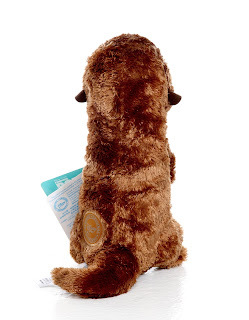 This adorable plush was released back in April and is as soft as can be. Note: Over the past week, I've reviewing the entire Disney Store exclusive Finding Dory plush collection. If you haven't already, be sure to check out my detailed posts on Mr. Ray, Crush, Nemo, Bailey, baby Dory, Marlin and the sea lion trio—more to come! This otter stands at 10" tall (a great size for cuddling), has an fantastically cute sculpt (with nicely stitched embroidered features including the standard "Disney Store Genuine Original Authentic" patch on the back), and soft, shiny fur. Kids, and maybe some of you adults out there, won't be able to resist hugging this one. Retail is $14.95. With the holidays right around the corner, be sure to pick this up at your local Disney Store (or online HERE) before it's gone! And don't forget— the Disney Store's friends and family sale ends tonight, so it might be a great time to save 25% on this and your entire order. 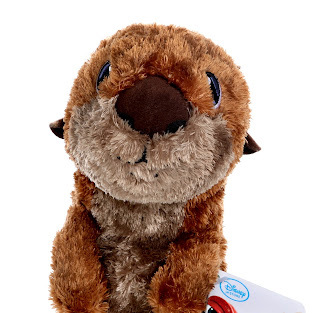 Also, in case you missed it, check out my post on the "Feature" (electronic) Otter plush 2-pack.